"The hands-down winner of the all-out best blaxploitation movie of the seventies," declares author and artist Darius James in That's Blaxploitation! Willie Dynamite may not be as well-known as John Shaft, Sweet Sweetback or Super Fly's Youngblood Priest, but he certainly deserves to be. Who is Willie Dynamite? He's the flashiest pimp in New York – he drives a personalised purple-and-gold Cadillac and wears some of the most eye-catching outfits ever seen on a cinema screen. He wants to be number one, but with the police, the D.A., fellow pimps and a tough-talking social worker on his tail, can a man as arrogant and amoral as Willie D avoid a downfall? 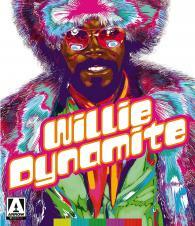 Willie Dynamite competes with the best of blaxploitation on all levels. Roscoe Orman dominates with his central performance – a star turn that's the equal of Richard Roundtree in Shaft or Pam Grier in Coffy. Multi-award-winning director Gilbert Moses balances action and social commentary as deftly as Gordon Parks, Jr. did with Super Fly. And the score by J.J. Johnson featuring Motown legend Martha Reeves is as catchy as anything composed by Isaac Hayes, Curtis Mayfield or James Brown.